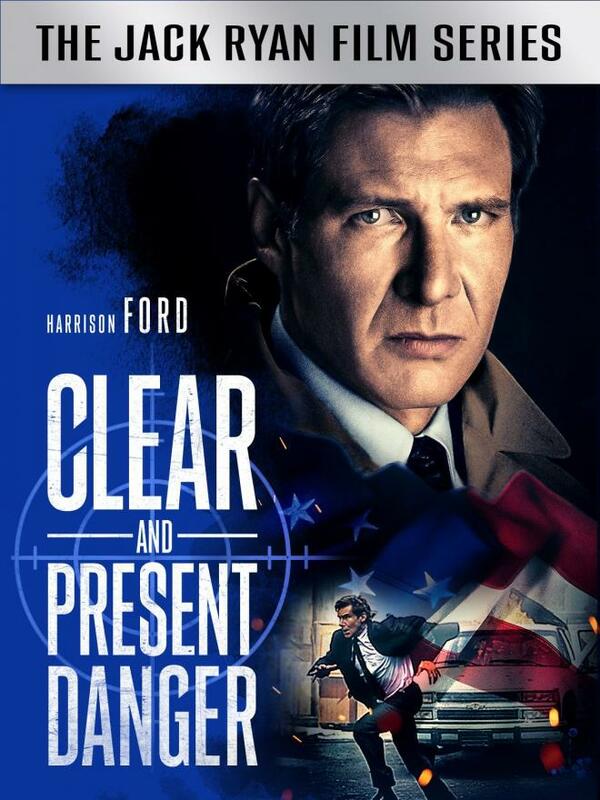 Based on the 1989 novel of the same name by Tom Clancy, Clear and Present Danger is the rare sequel that's better than its predecessor and makes an excellent addition to the Jack Ryan universe. 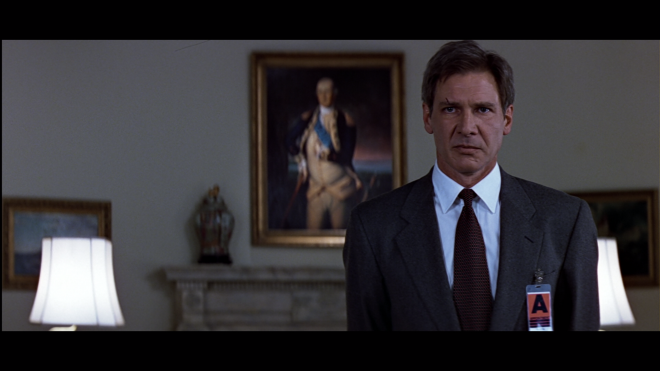 Featuring more clandestine intrigue, tension-fueled deception and a morally-complicated plot, the third entry in the film series sees Harrison Ford's everyman CIA analyst come into his role as a patriotic hero, making for a great and intelligent popcorn flick. As part of the ten-disc Jack Ryan film series collection from Paramount, the espionage thriller fights dangerous covert missions on 4K Ultra HD with a great-looking Dolby Vision presentation and an excellent Dolby TrueHD soundtrack. Porting over the same set of supplements as the Blu-ray, the overall package is Recommended for Jack Ryan fans and UHD enthusiasts. 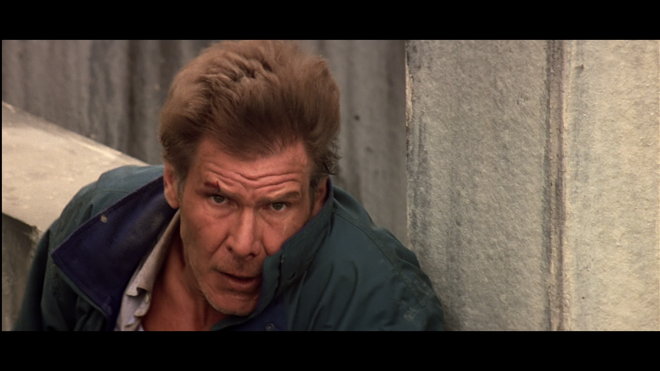 You can read our coverage of the Jack Ryan: 5-Film Collection HERE. Director Phillip Noyce pulled off one of those seldom-seen miracles with Clear and Present Danger, giving moviegoers and Jack Ryan fans the rare sequel that's better than its predecessor. I'm expecting some might disagree with that sentiment, but on purely stylistic techniques and story, this espionage thriller generates a bit more intrigue wrapped in a morally complicated plot with great kinetic urgency. The Australian filmmaker of Dead Calm and Blind Fury manages to create suspense from what would normally be seen as mundane conversations and situations, which he would later take with him in the excellent The Quiet American and the outstanding Rabbit-Proof Fence. Jack Ryan (Harrison Ford), now as Deputy Director of the CIA, in a computer-hacking race with co-Deputy Director Bob Ritter (Henry Czerny) to uncover secret, illegal operations in Colombia is a highlight. As we also later see in Salt, Noyce handles the action-combat scenes with the same level of tension and weight, even when it only involves soldiers surveilling drug cartels before big explosions. 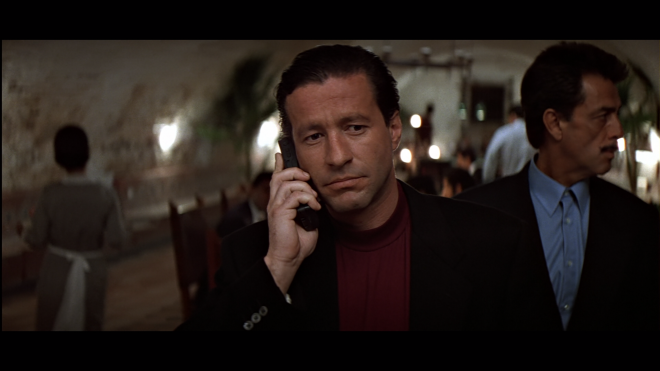 Unlike Patriot Games, this film is also more in line with the traditional idea of a sequel, taking place a few years after the events of the first movie. Not only is this because Ford reprises his portrayal of Ryan, along with James Earl Jones, Anne Archer and Thora Birch coming back to their respective roles, but the script by John Milius, Steven Zaillian and Donald E. Stewart are also the first to expand on the Ryan film universe. We see a toddler playing in the background of the Ryan household, the camaraderie between Jones and Ford feels more genuine, and Ryan's career in intelligence develops into other possibilities for uncovering of the world's injustices, including those he inadvertently unearths being committed by the U.S. President (Donald Moffat) and his National Security Advisor (Harris Yulin). 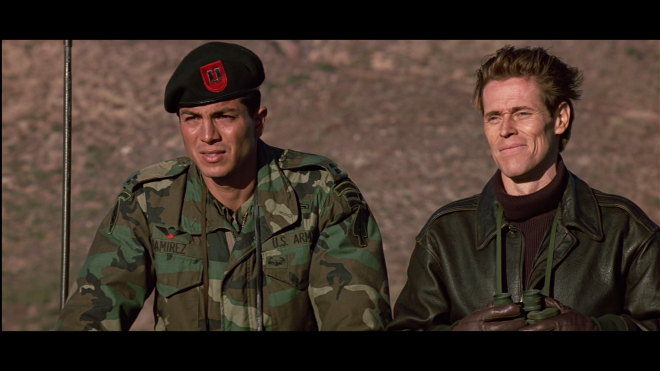 For fans of the book series, the follow-up introduces moviegoers to the morally-ambiguous spy John Clark (an awesome Willem Dafoe), further growing the franchise's grounded-in-reality element and since it's release, becoming the standard, along with Red October, by which all future Jack Ryan projects are compared. Paramount Home Entertainment brings Clear and Present Danger to 4K Ultra HD Blu-ray as part of the ten-disc combo box set dubbed Jack Ryan: 5-Film Collection. As of this writing, there are no plans for a standalone package. The pack also includes a flyer with a Digital Copy code, which can be redeemed via ParamountMovies.com, allowing owners to watch a 1080p HD copy with Dolby Digital Audio. However, VUDU users can unlock 4K streaming rights with Dolby Vision and Dolby Digital Plus 5.1 audio. Five dual-layered UHD66 discs are accompanied by another five Region-Free BD50 discs spread across three center spindles and on the opposing panels of a thicker-than-normal black, eco-vortex case with glossy slipcover. At startup, viewers are taken directly to a static screen with the usual selection along the bottom and music playing in the background. The third entry in the Jack Ryan series conducts dangerous covert missions on 4K Ultra HD with a great-looking HEVC H.265 encode, and like its predecessors, Donald McAlpine's stylized cinematography creates a few challenges for properly assessing picture quality, starting with the noticeably subdued contrast levels. Scenes taking place in the U.S. have a grayish and somber tone to them while the Panama and Colombia sequences come with an attractive, balmy, glistening glow that wonderfully befits the tropical climate. In any case, whites radiate with a luminous intensity and brilliance while crisp, narrow specular highlights dazzle the screen, allowing excellent fine detailing within the brightest spots and giving metallic edges a glossy, polished finish. Black levels are also notably richer and inkier with velvety shadows and great gradational differences in the various shades, providing the 2.35:1 image with a lovely cinematic appeal and appreciable dimensionality. However, delineation could be a tad stronger, as there are a few moments of very mild crush, but visibility within poorly-lit sequences remain well-defined for a majority of the runtime. 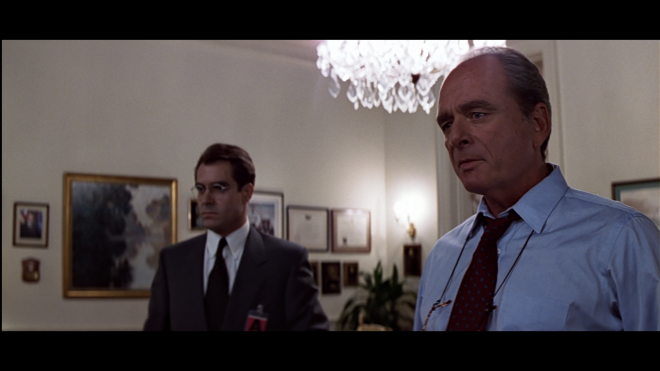 Shot on 35mm film, the 4K transfer enjoys a notable uptick, showing clean, sharp details throughout the CIA offices, in the mission-style architecture of the South American homes and in the surrounding foliage of the jungle. Individual hairs are distinct while the stitching and creases in clothing are plainly visible, and lifelike textures reveal pores and negligible blemishes. Arguably, the best aspect of this Dolby Vision presentation is the improved color palette with primaries, in particular, benefitting prominently. Most notably, McAlpine's photography displays a sumptuous array of reds, from the deep crimson of blood to animated cherry of the President's baseball cap. Meanwhile, the Panama-Colombia and jungle scenes are standouts with lively, spirited greens and picturesque skies while bathed in warm earthy yellows to reflect the hot tropical climate. Depending on the scene, computer monitors either glow a vibrant emerald or an electrifying cobalt. Secondary hues also show some nuanced differences and variation, looking a tad fuller and more accurate, but flesh tones occasionally waver between flushed and sunburnt in the same scene, meaning those taking place in South America. In the cold wintery weather of Virginia, the pale complexions are expected. The war on drugs reaches the shores of UHD with the same Dolby TrueHD 5.1 soundtrack as the Blu-ray, and while an object-based audio option would have been a welcomed upgrade, the lossless mix delivers an excellent and very satisfying aural experience.